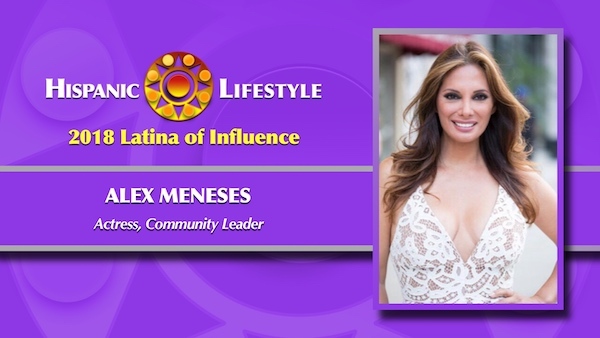 Hispanic Lifestyle is pleased to recognize Actress and community leader Alexandra “Alex” Meneses as a 2018 Latina of Influence. Ms. Meneses along with our entire list of 2018 Latinas of Influence are invited to participate in Hispanic Lifestyle’s 2018 Latina Conference taking place April 4 and 5, 2018 in Ontario, California. A proud alumna of Chicago’s Mother McCauley Liberal Arts High School, Alex frequently returns to campus and meets with students to share her insights and commitment to a McAuley education. In 2005 she established the ALEXANDRA MENESES ENDOWED SCHOLARSHIP to help ensure a new generation of young women are given the best possible career and life opportunities. Alexandra “Alex” Meneses, the ALMA Award nominated actress known for her smoldering bombshell characters and philanthropic commitment to a wide variety of causes, can currently be seen on The CW’s critically-acclaimed series JANE THE VIRGIN. She recently starred as Isabella, the over-the-top diva actress, on NBC’s comedy series, TELENOVELA, for which she received an Imagen Award nomination. Eva Longoria produced and starred. Alex first became embraced by audiences playing Teresa Morales in DR. QUINN, MEDICINE WOMAN. Her role as Stefania Fogagnolo, Brad Garrett’s luscious Italian girlfriend on EVERYBODY LOVES RAYMOND earned her ALMA Award and American Comedy Award nominations. Other TV roles include Joey Tribiani’s sister, Cookie, on FRIENDS, Sofia on THE GOLDBERGS, CSI, CSI MIAMI, PRISON BREAK, NCIS, PSYCH, AUSTIN & ALLY, and THE CLEVELAND SHOW. She recently filmed a pilot UNORGANIZED CRIME, opposite Chazz Palminteri. On film, the Chicago native and former model has also appeared in SELENA, BOYLE HEIGHTS, RIPPED, THE FLINTSTONES IN VIVA ROCK VEGAS, and the New York Film Critics Circle Award winning AUTO FOCUS opposite Greg Kinnear. Alex was Mistress of Ceremonies for Ischia Global Film Festival in Italy. As president and founder of her own production company (OOLaLa Productions/LADDS Entertainment) Alex produced the Sundance Channel hit documentary DAMNED TO HEAVEN, a gripping look at life inside the FLDS (Fundamental Church of Jesus Christ Later Day Saints) pluralistic community of Colorado City, Arizona. She also executive produced AUSTRALIANS HIT HOLLYWOOD, an honest look at Australians and New Zealanders who have turned themselves into prominent players in the Hollywood entertainment scenes. While still in high school in Chicago, Alex was inspired to pursue an acting career after seeing Rita Moreno’s performance in West Side Story and enrolled in the famed Second City Improv program. Following high school, Alex landed a modeling contract and moved to Europe where she worked regularly in Italy, France and Greece. Upon her return to the US, she entered The Lee Strasberg Theater Institute to hone her acting skills. She has received acclaim in the Geffen Playhouse’s production of OSCAR AND FELIX: A NEW LOOK AT THE ODD COUPLE by Neil Simon. An adapted revival of THE ODD COUPLE, Simon altered the ethnicity of Oscar & Felix’s neighboring sisters to Spanish, which fit Meneses who is half Mexican-American. Alex has appeared in numerous stage productions including HORTENSIA AND THE MUSEUM OF DREAMS at Chicago’s Victory Gardens Theater. Alex is a devoted mother to her young daughter and divides her time between Los Angeles and Chicago. We are submitting actor Alex Meneses for her community and philanthropic commitment. In her ongoing commitment to philanthropy and volunteerism, Alex has served on the Board of Trustees at Children’s Hospital of Los Angeles for ten years and has helped to raise tens of millions of dollars for the hospital. She also serves on the Boards for United Hope for Animals and The Chicago Symphony and is a member of The Chicago Historical Society.